There are hundreds of amazing tealight candle holders on the market, and choosing the right one for you is mostly a matter of personal taste and decorating style. Whether you're looking for a tealight arrangement to grace your dinner table or want something to add a little romantic ambience to your patio or deck, the perfect option is out there. Tealight holders come in a variety of different styles, and there's one that will be perfect for your home or event. Consider some of these popular options. A candle holder with a nature motif has a relaxed style that works well in many homes. You can display these candle holders in the bathroom to create a luxurious, spa-like retreat, and they also work perfectly in other areas of your home. 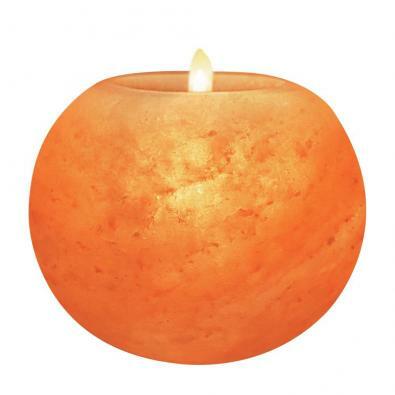 Himalayan Rock Salt Candle Holder - Crafted from a large chunk of Himalayan rock salt, this tealight holder emits a soft glow when lit. These holders are each unique and are available from Candlestock for about $15 each, and also at Amazon.com. Lotus Flower Tealight Holder - Formed in the shape of a delicate lotus flower, this candle holder is perfect for adding ambience to any room. The shell is edged in gold-colored metal for a touch of sparkle. It retails for about $10from Luna Bazaar. Branch Tealight Holder - This beautiful holder from Wayfair is made of metal and glass and displays eight tealights. It would make a lovely accent piece, and it retails for about $56. Sometimes, a touch of metallic sparkle can make a candle display really pop. Whether you choose gold, silver, or another metallic color, these styles bring elegance to your table, indoors or out. Gold Tealight Holder - This beautiful mercury glass candle holder from Luna Bazaar offers a gorgeous gold metallic glow and sumptuous antique style. It retails for about $4. Two-Piece Gold Dahlia Candle Holder - This exquisite gold-colored flower candle holder from Modsy comes apart to hold two tealights or can stack for major impact. It has a modern look and retails for $25. Tealight Holder With Netting - This stylish metal tealight holder from Zara Home would look perfect anywhere and retails for $16. Sometimes you need a tealight holder that stands out from the crowd. Whether you're looking for a piece that shows off a special interest or you simply need a candle holder that is whimsical and quirky, a novelty holder can be a fun choice. Dragon Candle Holder - This polyresin holder features a dragon attacking a medieval castle. There are spots to hold three tealights, and the holder sells for about $16. 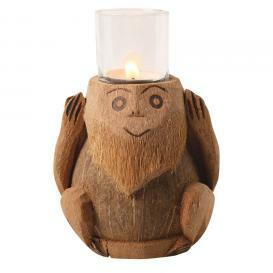 Three Wise Monkeys - This cute set of coconut tealight holders follows the hear no evil, see no evil, speak no evil theme. Each holder comes with a glass inset so you can safely burn you candles. The set retails for about $55 at Amazon.com. 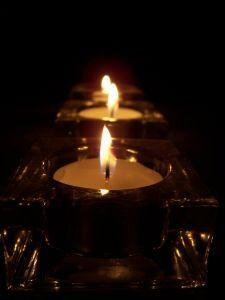 The holidays are a great time to display tealights around your home. There are holiday holders in all kinds of styles and motifs. Angel Tealight Lamp - This exquisite angel tealight holder from Amazon.com looks like a miniature lamp. A delicate pewter angel makes up the base, which is topped with a simple glass shade. It retails for $30. Spider Tealight Luminary - Perfect for your Halloween centerpiece, this tealight holder with spider cut-outs from Pebbles in My Pockets is crafted of metal and retails for $1. Silver Tree Tealight Holder - This festive tree tealight holder from Shop Wild Things is made of cilver-colored metal accented with beades and will hold five tealights. It retails for about $40, and would perfect for any Christmas or winter celebration. A tealight also looks lovely displayed in a sconce on your wall. This is a great way to accent artwork or bring attention to another focal point in your room. Scroll Tealight Sconce - This elegant, framed sconce from Pier 1 is a gorgeous choice to use as an accent in your home. This holder retails for $90. Star Stella Tealight Sconce - Featuring a stunning star-shaped design which holds one tealight, this sconce from Root Candles will make a major impact on any wall. It retails for $30. Amber Lilies Wall Sconce - This pretty floral sconce is sold by Houzz. It's crafted from amber glass and metal and holds two tealights. It retails around $14. Candle lanterns look great resting on a table or strung from trees or posts outside. They come in a range of beautiful styles. Lighthouse Tealight Holder - This stylish lighthouse-style holder from Amazon.com is crafted from metal. It's designed for indoor and outdoor use and retails for about $6. Birdhouse Tealight Holder with Stand - This adorable lantern-style tealight holder features a metal birdhouse hanging from a stand with a bird perched on top. It's available at 100Candles.com for $10. 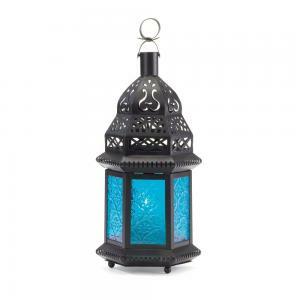 Moroccan Lantern Blue Glass Tealight Holder - This brilliant blue tealight lantern looks exotic and lovely indoors or out. It features elaborate metalwork and glass sides and displays one tealight. It retails for about $9 on Amazon.com. Although there are many beautiful tealight holders to buy, you can also make your own. Homemade tealight holders make great gifts and allow you to personalize your decorating. You can also make tealight holders from paper bags to decorate with luminaries for a special event. No matter which style of tealight holder you decided to make or buy, you'll love the way these tiny candles provide a subtle, delicate glow. Inside or out, tealights and decorative candle holders can add the finishing touches to your decor.